Mumbai, October 22, 2018:The Indian Plumbing Association (IPA), the national body of Plumbing professionals with 4000 members and 20 chapters across the country, today announced that the pressing problem of water conservation and its reuse would be the key focus of its 25th Indian Plumbing Conference & Exhibition (IPC), set to be held in the city’s Nehru Centre at Worli between October 26-28, 2018. The IPA would also simultaneously be celebrating its 25th Silver Jubilee Anniversary on the occasion. Mr. Hardeep Singh Puri, Honourable Union Minister for Housing and Urban Affairs has consented to be the Chief Guest at the 25th IPC based on the importance of ‘Water for a Better Tomorrow’. Mr. Sanjay Dutt, MD of Tata Realty and Tata Housing has also been invited as the Guest of Honour. The 25th IPCE will also see participation from the entire World Plumbing Council (WPC) Board, including Chairman WPC & CEO – Plumbing Industry Climate Action Centre, Australia; the CEO of the International Association of Plumbing & Mechanical Officials (IAPMO), USA & MD of the American National Standards Institute (ANSI), and many such luminaries including the MD of Rain Water Harvesting & Infiltration Association of Japan, giving it a truly international flavor. Besides around 50 of India’s top companies in the sector like Jain Irrigation, Astral Pipes, Kirloskar Pumps, Ashirvad Pipes, Prince Pipes, Finolex Pipes, Jindal Stainless Steel, and Grundfos among others are also expected to participate. The 25th IPC will see talks and discussions by such global and domestic industry leaders around the theme of the World Plumbing Council 2018, the ‘4 Pillars of Plumbing’ as in ‘Practices–Standards and accountability in day-to-day work in the industry’, ‘Products– Features and quality of the materials, fittings and appliances used in plumbing work’, ‘Participation– Primarily the training requirements to work in the industry ’ & ‘Protection– Measures to minimize risks and provide redressal when failures occur’. The 25th IPC will also host Prabhuji Gauranga Das of ISKCON, who will deliver a motivational address on Water. As all of us are aware, 11 cities in India are listed as moving towards water bankruptcy and it is with the advent of reduction in fresh water supply, and increase in pollutants and untreated sewerage, being unscrupulously released into fresh water streams and supply, the reduction in clean potable and fresh water, both for domestic and agricultural purpose has reached enormously low receding levels. We are truly in a crisis and war like situation and if we do not take ICU meditated and planned measures, most of our urban cities will be highly water stressed, with some reaching water bankruptcy, earlier than later envisaged. IPA needs to make drastic steps towards water stability. 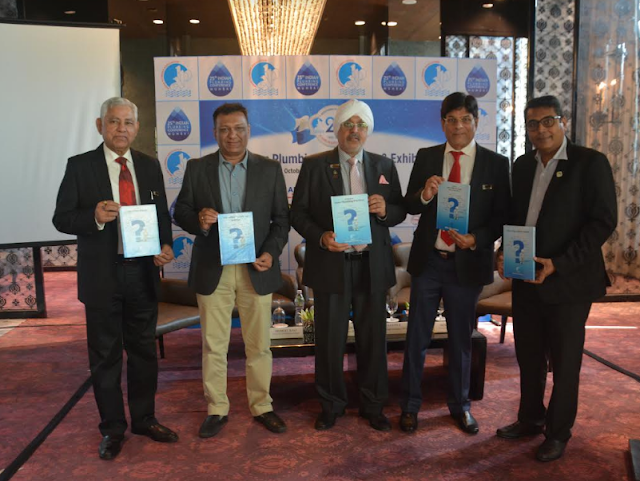 The Indian Plumbing Association has an enormous task to ensure that we reduce water supply at source, treat and retreat and recycle waste water, rain water harvest, educate the consumer in apt and correct use of water and prevent leakages in plumbing systems, to ensure that we have clean and fresh water for our generation and their generations to come. Water is a finite resource and part of the ‘Panchbuttas’ as in ‘Jal’, ‘Vaayu’, ‘Agni’, ‘Akash’ & ‘Dharti’ and unless we preserve and respect water that we have today, we will have none left for our children & their children to come. It is therefore important that media takes cognizance as conscious keepers of society and acts responsibly in propagating the apt use of water to ensure that water is not mistreated. 70% of the communicable disease is transmitted through bad quality of water. Diarrhea is a bigger killer than even ‘Cancer’ and ‘Aids.’ No doubt a Plumbing Engineering Degree is termed as ‘Pubic Health Engineer’ because he is responsible for the health of millions. Plumbing is a science, backed up by 1,000s’ of pages of Codes & Standards. Approximately 12% to 13% of the Construction cost is attributed to plumbing and part of every construction whether HIG, MIG or LIG, it is an important stream and an integral part of construction. The IPA is aware of it’s responsibilities in supplying disease-free water at correct pressure and flow rate, to ‘use and reuse’, ‘treat and retreat’, ‘rain water harvest’, ‘educate in apt use of water’ and ‘use Low Flow Fixtures & Sanitaryware’ to leave water for the future. IPA is the only National body of Plumbing Professionals, therefore, takes great pride in the important work it does for the nation.